Solar energy is the most clean and viable alternative to fossil fuels. Light from the sun contains energy that has fueled life on Earth since the beginning of time. Usually, the energy from the sun turns into heat but by utilizing the special properties of silicon people are able to convert that energy into electricity. Solar energy is the most eco-friendly alternative to fossil fuels. By using the sun, a solar panel system will produce zero carbon dioxide emissions. Even when accounting for the emissions involved in the production of the materials necessary for capturing the sun's energy, 87%-97% of a PV system's 30 year life will be considered to be zero emission. As technology for PV systems advance even further, that percentage will only rise. An interesting thing to note is that PV systems can give your home more energy during the summer than the winter. In the summer the northern hemisphere is tilted towards the sun, creating longer days and a more direct, intense stream of sunlight than in the winter when it is tilted away from the sun. Consumers should also rejoice in the fact that solar installation demand doubled from 2007 at 2,826 MW to 5,948 MW in 2008. Experts predict that solar energy will double annually because, finally, current technology allows installations to be efficient and cost-effective enough for the average consumer. One can feel comfortable in the purchase of a solar installation, now, knowing that the energy produced can exceed the demands of one's home. Further predictions by expert engineers also say that in 20 years, solar power will be able to produce all the energy needed to meet the needs of the whole planet! This idea is very feasible when considering that there is 10,000 times the amount of sunlight than is needed by the whole world. With the advent of nano-engineered cells, the efficiency of going solar will be tremendous on a worldwide scale. Imagining a world without smog-ridden factories is quite achievable through the use of solar energy. 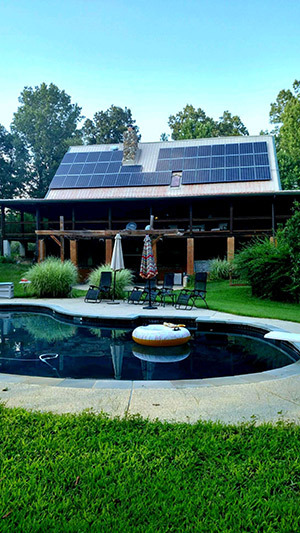 As of right now, an energy efficient home that is utilizing solar energy can produce more than 100% of its energy use! In Maryland, your utility company is required to credit you for the excess generation. You dip into this credit on less-sunny days or at night and may carry the excess credit forward for up to 12 months. After that 12 months, if the amount of energy you have on their grid is worth at least $25, you will receive a check from your utility!